President Obama wasn’t alone in switching positions over the bill. Senator Bob Corker, who’s expected to become chairman of the Senate Foreign Relations Committee in the new Congress that begins next month, had embraced the State Department’s earlier view that sanctions would undermine international talks engineered by UNASUR and the Vatican. The Caracas government’s refusal to make concessions in the talks undermined that argument, however, and a three-way diplomatic dustup between the U.S., Aruba, and Venezuela over another issue – Aruba’s refusal to extradite Venezuela’s designated ambassador, a former Venezuelan army official, to the United States on narco-trafficking charges – further frustrated Washington players. Corker asserted that the incident showed that Venezuela’s “complicity with criminal activity” could not go unchecked since it directly undermined U.S. interests. 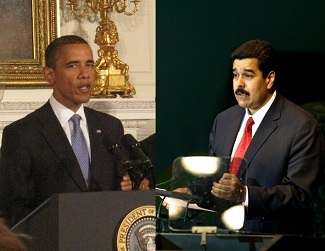 Immediately after the extradition episode, the Obama administration imposed unilateral sanctions – travel and visa bans – on a dozen unnamed Venezuelan officials, laying the groundwork for Menendez and Rubio to reintroduce their legislation and drive it home before Congress adjourned for the holidays. Corker endorsed the bill, although he highlighted that a “regional dialogue” remained the best option for finding a “negotiated, democratic way forward” to address human rights issues. Other than punishing reported human rights offenders – and making an example of them – the new bill is unclear on how it could help resolve the deep political crisis that has given rise to the protests and subsequent abuses. With Maduro’s popularity plummeting to new lows, strident rhetoric condemning U.S. “intervention” could give him a modest boost by bolstering his claim that Washington is part of an “economic war” against Venezuela. It is far too early to tell whether that nationalistic narrative will work in the government’s favor as the country’s dire shortages have become permanent and economic suffering is increasingly blamed on Maduro’s policies and declining oil prices. If human rights really are the U.S. top concern, Washington might want to be more sensitive to the positions of PROVEA and other Venezuelan human rights groups, which have denounced the legislation despite its inclusion of funding for Venezuelan civil society groups. If punishing rights abusers is Washington’s way of pressing for sustainable change in Venezuela, then it needs to state the case that penalizing measures imposed since 2008 have made a difference. Another option, contained in Senator Corker’s observation about a “negotiated, democratic way forward,” could be to renew support for talks sponsored by South American countries, as these are more likely to reduce tensions, improve rights, and give moderates space to promote electoral solutions.